After watching the Food Network show Chopped for the sixth or seventh time and annoying the people around me with "oh I would make this!" or "wait why wouldn't you use the ingredient this way?" I decided to do something about this desire to create meals out of random ingredients. I invite you all to join me on this monthly adventure. 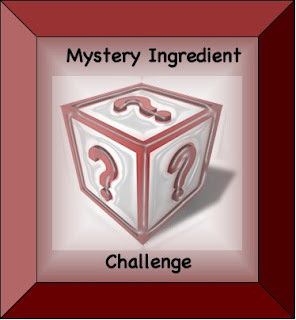 Each month I will post the mystery box of ingredients. Your job is to create a dish that utilizes all of these ingredients and document the preparation and final product as well as a review of how it turned out. Post a link to your documentation in the comment section of the mystery box post. At the end of the month, all eligible entries will be entered to win a fabulous prize! The contest closes the last day of the month at midnight. While you can use other ingredients from your pantry, the dish must include the mystery ingredients. The prize is: Let's start off the challenge like I enjoy starting my mornings. Starbucks! The winner of the challenge will receive a $10 Starbucks giftcard. Remember you must use ALL of the ingredients of the mystery box in the one dish. Please take pictures, post your recipe and a review in your blog! You should also copy the mystery box logo and link back to this post in order to qualify. oooh, a challenge- fun!! tough set of ingredients! Oh I love this challenge! I already have ideas swarming in my head! Ok I love this!! So we can use anything else that we want but has to include these three ingredients??? Also, does it need to be WW friendly or no??? One dish with those 3 in it..? When does it have to be posted by? Sorry I know a lot of questions? Just already have an idea!!! You can use anything else you want, just as long as you include those three ingredients. It does not have to be WW friendly. One dish that includes all three items. It should be posted and linked by midnight March 31. I will be the only one to test it out though, DBF won't/can't eat the first 2. Cool, I'm in. I'll have to find time to experiment next week, I have a few ideas but I need to make sure that they work!